The Common Pheasants (Phasianus colchicus) are known by a variety of names - depending on physical features, their ranges and purpose - including Ring-necked Pheasants, Game Pheasants, English Pheasants, Chinese Pheasants, Japanese Pheasants or simply Pheasants. 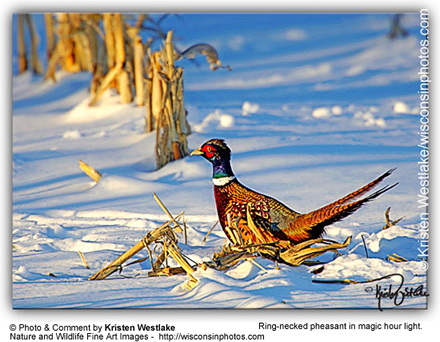 This pheasant was named the official State Bird of South Dakota. These pheasants have a broad range over much of temperate Asia; and have been introduced nearly worldwide, including North America, Hawaii, South America (Chile), Europe, Tasmania and New Zealand. Most of those occurring in North America belong to the Chinese Ring-necked Pheasant group (Phasianus colchicus torquatus / formosanus). 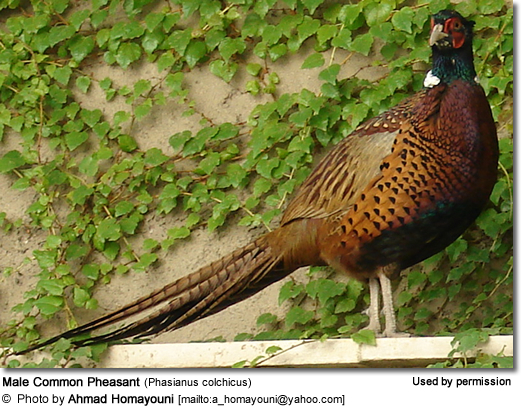 They are abundant and widespread; and may be the most common of all pheasants. They are one of the world's most hunted birds. These popular game birds are commonly introduced into many regions of the world and captive bred for the main purposes of releasing them into the wild for the hunting season or for supplying them to restaurants. Common Pheasants are non-migratory within their range (permanent residents). Their original range extends from between the Black and Caspian Seas to Manchuria, Siberia, Korea, Mainland China and Taiwan. North America : In the United States, they are most common on the Great Plains. They occur throughout much of the Rocky Mountain states (Colorado, Montana, Wyoming, etc. ), the Midwest and the Plains states. In the southwestern USA, they are found south of the Rockies in Bosque del Apache National Wildlife Refuge south of Albuquerque in New Mexico. They have also been introduced to the Hawaiian Islands. Populations also established in Canada and Mexico. Variation in coloring is common due several subspecies having been introduced and hybridization between them. United Kingdom: Subspecies P. c. colchicus, P. c. torquatus, and other suspecies were introduced into the UK; and have hybridized. Most dark-winged ringless pheasants in the UK are descended from Chinese Ringneck and Green Pheasant hybrids. 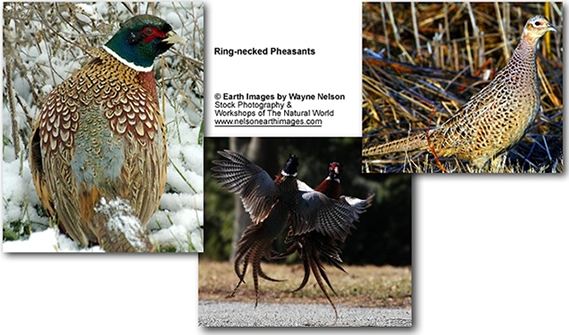 Common or Ring-necked Pheasants inhabit woodlands, farmlands, scrub and wetlands. Within their natural range, they are found in grassland areas, typically near water, with small copses of trees. Common Pheasants are generally sociable and, outside the breeding season form loose flocks. During the daytime, they generally are seen feeding on the ground, and at night, they roost in sheltered trees. Even though they can fly short distances, they typically prefer to run. When startled, they will suddenly burst upwards at great speed, making a distinctive "whirring" sound with their wings and alerting other birds with loud kok kok kok calls. Their normal flight speed is about 27 - 38 mph (43-61 kilometers per hour); however, when chased, they fly up to 60 mph (90 kilometers per hour). Over 30 subspecies are recorded. They can mostly be identified by the male plumage, specifically the presence or absence of a white neck-ring and the color of the uppertail (rump) and wing coverts (feathers). The females of the different subspecies mostly look alike. ID: No neck rings. The wing coverts (feathers) are buff to brown. The upper tail coverts are rusty to chestnut colored. ID: No neck ring or only a trace of it. The wing coverts are white. The general plumage and the uppertail coverts have a bronze to brown hue. Range: Northeastern Russia - Turkestan and adjacent Mongolia. ID: They have a broad neck ring. The wing coverts (feathers) are white. The uppertail coverts have a rusty to chestnut hue. The general plumage has a copper hue. ID: They either lack or have only a trace of a neck ring. The wing coverts (feathers) are buff or brown-colored. The upper tail feathers are light olive ranging to dark khaki. Range: Widespread throughout China extending to northernmost Vietnam and Taiwan in the south and to the Strait of Tartary region. ID: The wing coverts are tan to light grey (sometimes almost white). The uppertail coverts are grey to powder blue with orange tips. The top of head is light grey. Ring-necked Pheasants are large birds, measuring 20 - 35 inches (50 - 90 cm) in length, including the 8-inch (20-cm) long, pointed tail, which may account for half its length. They weigh between 1.1 - 6.6 lbs (0.5 - 3 kg), with males averaging 2.6 lbs (1.2 kg) and the smaller females about 2 lbs (0.9 kg). The male can be identified by his barred bright brown plumage and green, purple and white markings, with a white ring around neck being seen in some (but not all) subspecies. The head is green with a small crest and distinctive red patches around the eyes. However, mostly due to captive breeding and hybridization, many color forms of the male Common Pheasant have occurred - ranging from nearly white to almost black. The female plumage is mostly drab and mottled brown. Juveniles look like females, except for shorter tails. Immature males show the characteristic bright feathers on the chest, head and back about 10 weeks after hatching. The female's plumage is similar to that of the partridge. 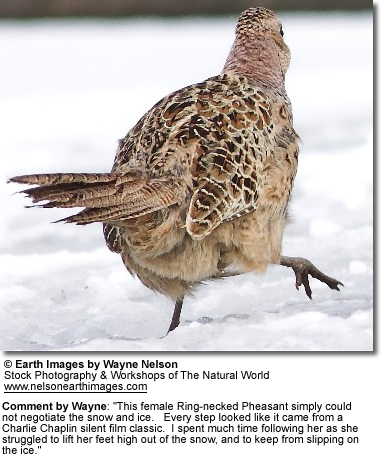 She could also be confused with the Sharp-tailed Grouse or Greater Prairie Chicken. The Green Pheasants are very similar to the Common Pheasant, except males have a darker plumage that is bottle-green on the chest and abdomen. They usually have shorter tails and don't have neck rings. The females are darker with many black spots on the chest and abdomen. In the United States, the Common or Ring-necked Pheasants mostly breed from February to June. The males are polygamous and will mate with several females. They are often in the company of several females. The nest is placed on the ground. The average clutch consists of 6 - 12 eggs that are laid over a two-week period. The hen incubates the eggs for about 23 - 26 days to hatching. The chicks remain near the hen for several weeks. The males may help in rearing the young. The chicks grow quickly and resemble the adults by the time they are about 15 weeks old and they are of breeding age when they are about one year old. Pheasants do best in large, well-planted aviaries, where they can be kept with other pheasant species, preferably long-tailed or ruffed pheasants (Monals or Tragopans); or else hybridization may occur. Numerous color mutations have been developed in captivity, such as white, buff, red, pied and melanistic (dark) mutant pheasants. A melanistic (dark) form is commonly seen among wild populations in the UK. 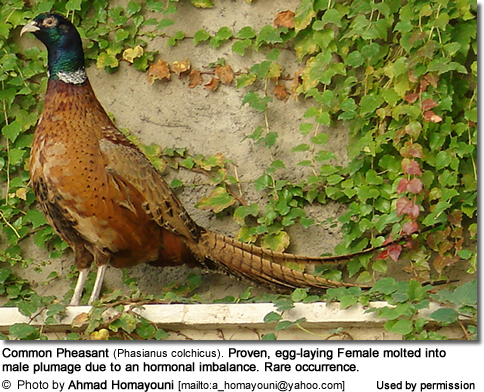 The Green Mutant Pheasant is common in American collections. Common pheasants are omnivorous, foraging on the ground for grains, leaves, fruits, seeds, roots, berries, buds, acorns, insects, earthworms and snails. At times, they may take small mammals, such as mice; as well as snakes, lizards, frogs and small birds. They are often seen scratching on the ground with their feet or bills to uncover food. Their alarm calls consist of harsh croaking notes when alarmed. The males' calls are a loud crowing khaaaa-cack.